It’s a simple thing, hot food. It seems so basic until you really stop to think about it. Who stopped and put that first flame to a piece of fish, and why has it become such a huge part of our lives? The fact that it does seem so intrinsic makes it all the more important, and thus is your stove. 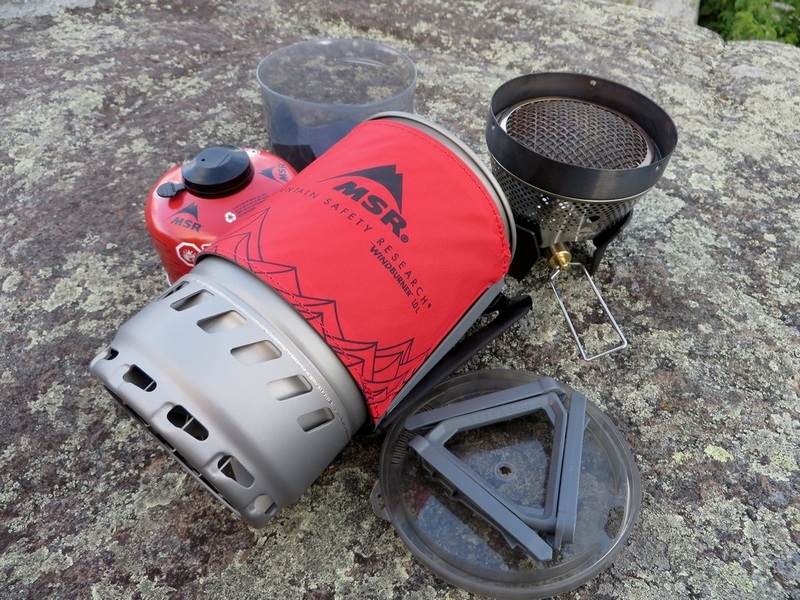 The Windburner Stove from MSR is an all in one cook set that’s designed to deliver hot food as quickly and efficiently as possible (around 2.5 minutes). It achieves this by using a radiant burner stove that locks directly into the cook pot, which has a built-in heat exchanger. This transfers practically all the heat from the stove directly into the cook pot without losing energy to the surrounding air. The entire kit nests together to pack down and take up minimal space. This includes the 1.0 liter pot, a cozy with a heat-resistant handle, lid, a 16 oz. bowl and a fuel can stabilizer. The complete setup weighs 15.25 oz. and retails for $129.95. The efficiency of the design is incredible, both in burn time and pack size. Only windy cool nights at 6000 feet with a near empty can of fuel, the stove managed to bring water to a rolling boil in an impressively short amount of time. I didn’t time it, but I believe it to have been around 2 minutes. Using the stove multiple times barely made a discernible difference in the amount of fuel left in the small canister that I was carrying around. The pack size is great. Taking up minimal room as everything packs down with the precision only achievable by an engineer. The bowl slides onto the bottom, while the stove, fuel can and stand all fit within the boil pot itself. There’s no wasted space here. The stove is simple to use. 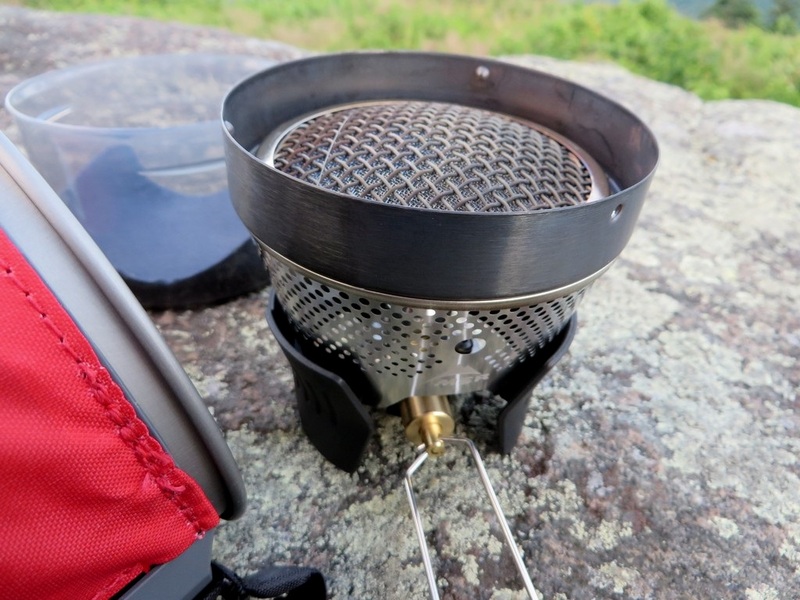 Set up the fuel stand and can, attach the stove, light it and a quick twist attaches the cook pot. The lid snaps on easy so you don’t have to worry about tipping over your stove while cooking. It also has a sip port and a series of holes for draining your noodles after boiling. The handle makes for a nice stable grip on the entire unit and the cozy prevents burns while also insulating your cook pot, further improving efficiency. The entire kit is built exceptionally well, as per usual with MSR. The cook pot is thick and rigid, with quality welds holding on the heat exchanger. The radiant burner is forged from solid steel, without giving or flexing under weight. The cozy and handle are also built well, with a thick nylon like material and high quality stitch work holding it together. This will last for years. The impressive efficiency means you can carry less fuel, and you’ll be buying fuel less often. Typically I carry a larger fuel size, but here, I never felt the need. This is a chance to save weight and money over time. There is no built-in or included ignition source, so you’ll have to pack one in. I found myself using my usual flint striker to start the stove (quite easily I’ll add), and lighters work just fine also. To achieve this pack size you’ll need to use the MSR brand of fuel canister, as it’s designed to fit perfectly inside. Other sizes and brands of fuel canisters probably won’t nest properly. Minor, but worth nothing. The trade-off of speed and efficiency is a little extra weight, meaning the kit will likely weigh more than many other pieced together cook systems. It’s not heavy by any stretch, but there are lighter options. This saves fuel by avoiding larger, heavier canisters, however. With all stoves, heat is involved so care must be taken while in usel. Just above the plastic guard near the fuel valve is the hot spot. Care must be taken to not touch this area when locking the stove into the cook pot. 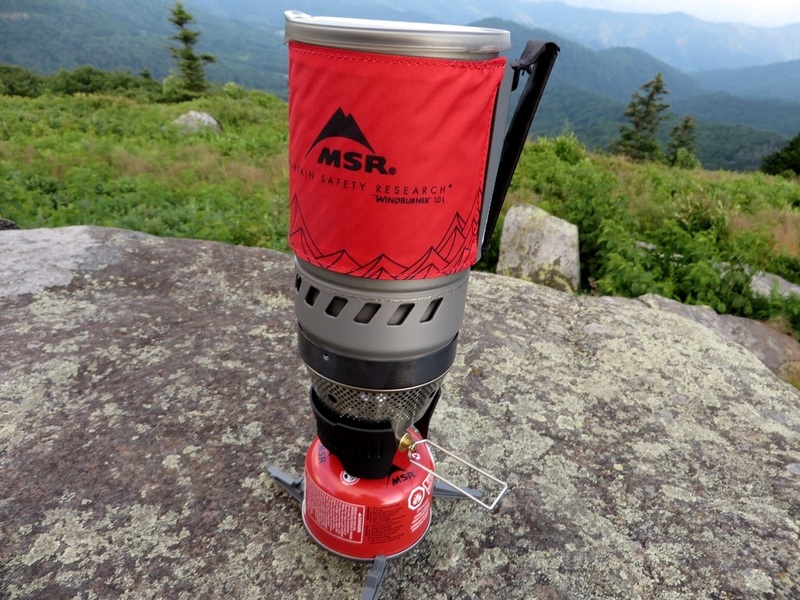 The Windburner is an impressive offering from MSR. Efficiency and boil time are impressive, and the weight is quite manageable. I loved the pack size and organization that it provided in itself. Setup is easy, and the cook system is stable thanks to the interlocking design and included stand. Build quality is certainly a plus here, with a strong cook pot, rigid stove, and an overall package that feels like it may in fact out last me. The last thing I want to do is spend more time at camp cooking than relaxing. I have a feeling I’ll be using the handy cozy and sippy lid to drink my hot cocoa for many years with this one. Color me impressed. 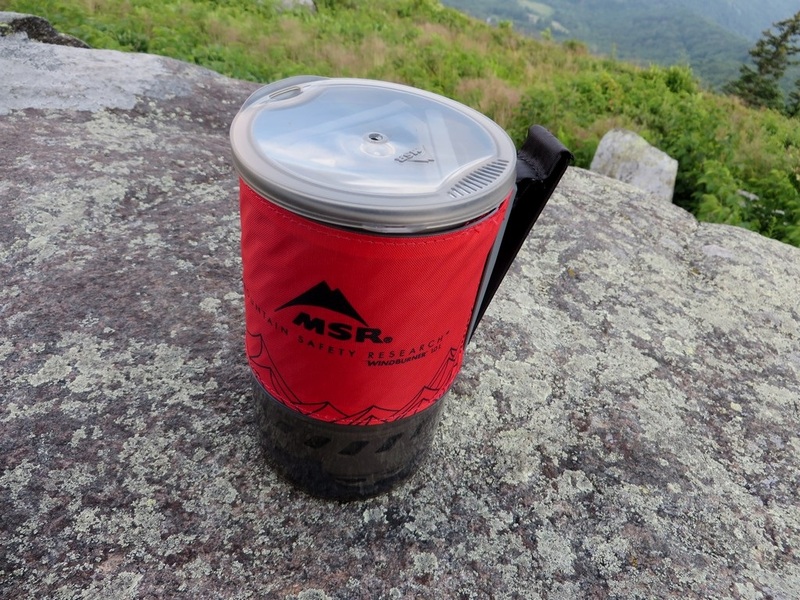 A big thanks to MSR for providing this exception piece of gear for review. For more information, check out their webpage, Cascadedesigns.com. Our full disclosure is available on the Contact us page, as well as details on how we rate our products. If you have any questions or comments, rock them below, email us directly, or find me on Facebook or Twitter (links to the right). Thanks for reading! I certainly appreciate it. 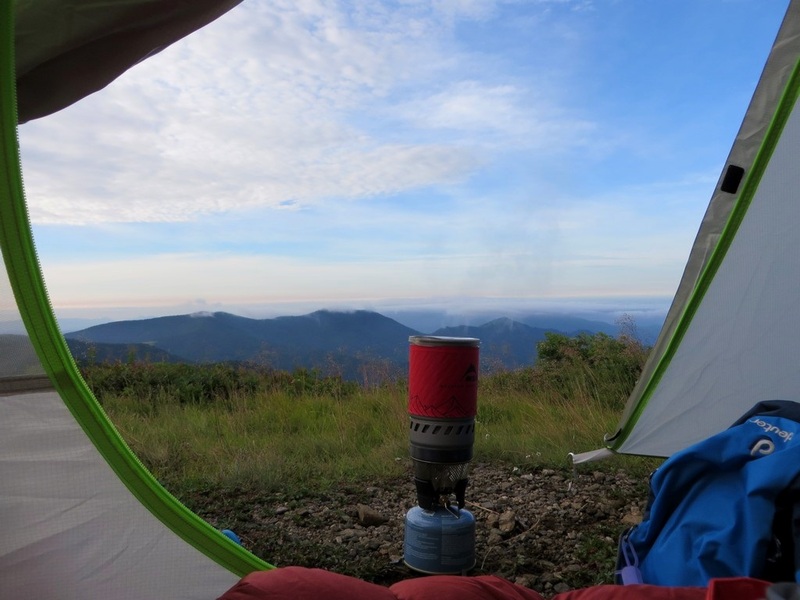 Thanks for sharing your review on the MSR WindBurner stove system. After lots of research I ended up selecting this system for myself. So, based on my numbers, the actual weight of the complete setup is: 24.15 oz. Hope this helps to clarify the weight of this system for people reading your post. Hi Meno! Thanks for pointing that out. it’s interesting how wildly the weights from one item can vary from one to the next, and yes, the fuel can wasn’t included in our numbers. Thanks for clarifying! Thanks so much for reading. I hope you’re enjoying your WindBurner! After years of being without a stove, I’ve been eating cold stuff for a while based on a very disappointing experience south-east of Aspen where an expensive swiss stove failed to function at 11k feet. I am going to give this a try. Thank you for mentioning altitude, I always seem to find myself way up there, even my yoga teacher holds retreats and never seems to go below 5k feet. My question is, the top when open looks flat. Could I place a frying pan on top of that, or do I need to pack a separate stove? I couldn’t bring myself to going without a hot meal. You’re stronger than I am! It’s an excellent way to shave weight though. While you could place a frying pan on there, I wouldn’t recommend it. It would probably produce far too much heat for any pan, causing warping and probably destroying the finish too. 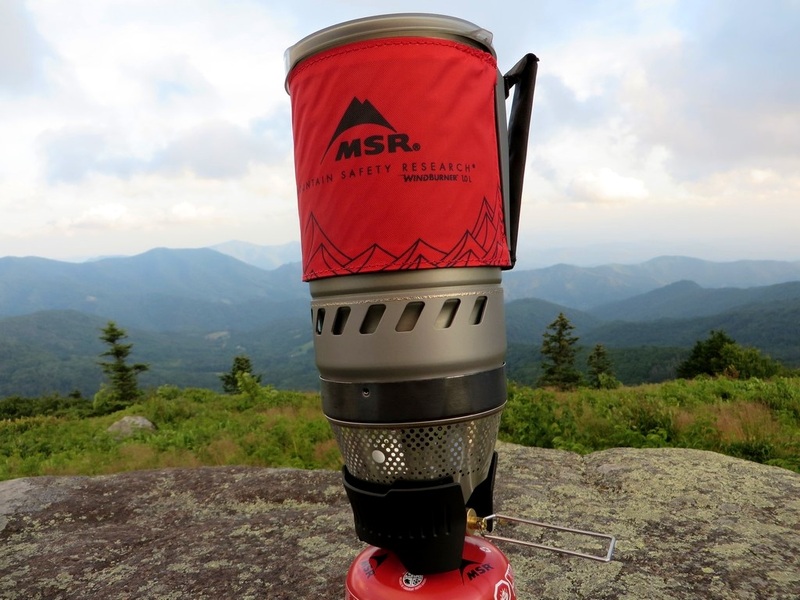 Have you consider the MSR Wind Pro 2? It works great at higher elevation as it can actually liquid feed when needed by inverting the canister, and it supports pots and pans very well. It’s my personal go to as it’s light, super reliable, and works in practically any condition. Not this one. It’s mostly designed for boiling water. I wouldn’t recommend trying to cook anything inside.